Despite his age, he is only 5ft 3in. This is due to him having Highlander's Syndrome, a disorder that stopped him from aging when he was fourteen. People often mistake him for fourteen or younger. He has pale smooth skin. His hands are small and his shoulders are small and smooth. He has large eyes and a button nose. He has hetochromia, the disorder that gives you two different eye colors. His left eye is yellow while his right eye is red. 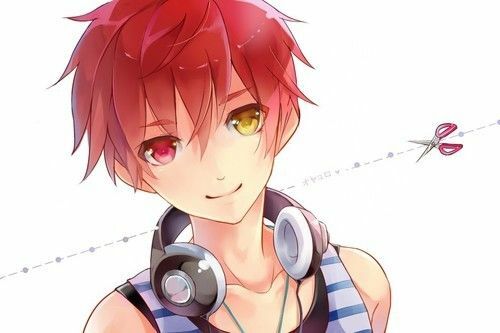 He has shaggy red hair due to his Irish heritage, and his bangs are long enough to cover his small red eyebrows. He always wears a blue and white striped tank top and dark blue shorts with white flip flops. If he doesn't wear that then he's naked, has a swimsuit, or wears his old school uniform as a suit. Around his neck is the ever constant white headphones. Kohaku is lonely. He hates being alone, but does it to avoid the pain of losing his loved ones. He knows that he will outlive everyone he knows unless he is killed. People find him intriguing, which draw people to him. He tries to avoid social places. Very little makes him happy, but when around people he appears cheerful. The only thing that makes the pain go away is music. As long as it isn't rap, he will listen to it. He has a hard time loving people because he knows that they will be gone in an instant. He is very polite. When he was 14, his mother of 43 years reveals that he has Highlander's Syndrome. This made him become secluded and anti-social. He graduates school ad waits for college to start. His mother passes away from the grief of losing her dead husband, leaving the house to him. He used to be the fastest swimmer until he left. He currently works at a art shop with his boss, Hikaru.